No, this is nothing like the Disney fairy tale we’ve all loved and watched growing up. It’s about gorgeous ladies showing love to their furry friends. Now guys, don’t we all love fine-looking and animal-loving women? They love them so much that they’re willing to share their personal space. Curious? Read on to find out. Like mommy, like puppy. This adorable pup and her beautiful mommy take cuteness to the next level. With matching outfit and pose, we cannot deny the connection between them. Not to mention both are in great shape. 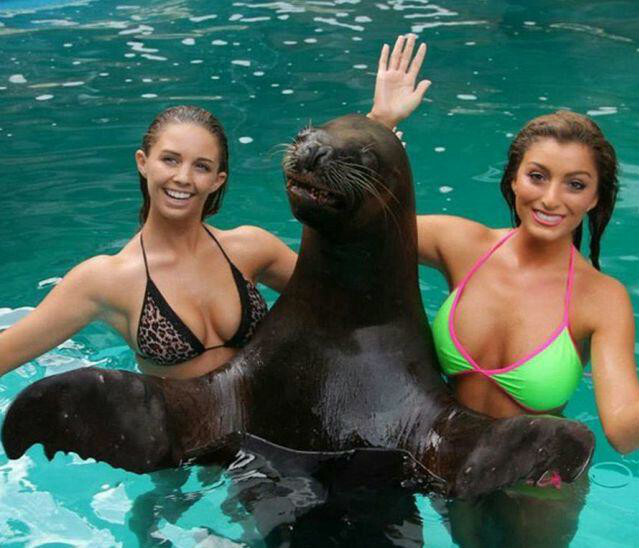 This seal is definitely having a good time. Who wouldn’t be when you are sandwiched between two stunning ladies. I bet he’s willing to do any trick just to entertain them. I think this huge sting ray wants to have a closer look at the foreign creature. Making new friends couldn’t be this much fun. And how brave is this blonde for letting it get that close? They’re both definitely having a blast! This Great Dane chills while guarding his favorite human. Though he seemed unamused by the difficult yoga pose his owner does. He’s probably in doggie land day dreaming. This Shepherd mix can tell that something is about to pop out. So for his sanity, he covered his eyes.